Most people who aren’t teachers (or in teacher families) don’t acknowledge that this job is challenging- and it ABSOLUTELY is, in so many ways." For me, the biggest challenge in teaching is that the work never ends. I care so much about my students. And that is an AWESOME thing. And I love what I do! There’s something so satisfying about finding ways to teach each lesson better, and something so rewarding about finding ways to connect to each and every student I teach. But that means that I am never, ever, ever DONE. I could work on “school stuff” for 24 hours a day, 7 days a week, and I would STILL think of something else I could be doing for my kids. And while it’s wonderful to be so invested… it’s exhausting to go in before contract hours, work hard all day, stay another hour or two, and then bring a teacher bag home. It’s not fair to my husband when I’m grading while we watch a movie “together.” It’s not showing my family how much I love them when I spend our entire Sunday working on lesson plans instead of spending quality time with them. And worse? I STILL beat myself up for feeling behind, and for not doing enough. Surely that sounds familiar to some other teachers, too? For so many people, New Year’s Day is a fresh start- but for me, the time for resolutions is back-to-school. And every year, I tell myself I’m going to finally be organized, not procrastinate, and not live at school. Last year, I finally did a little better. I’ve still got a LONG way to go- but I cut back so much on the hours I spent on my classroom, and it’s all thanks to Angela Watson. She started a course called the 40 Hour Teacher Workweek Club. Of course, 40 hours sounds nice- but the goal of the group isn’t about any specific number. It’s about streamlining and building efficiency as a teacher so you can spend less time working without being a less effective educator. Always make a To Do list before the morning. If I come in with the list ready, I don’t have to waste one second thinking about where to start. Even better? I don’t forget as much. Sometimes, this is as simple as a Post-It- but it sets the pace for my day in such a powerful way. Make a better To Do list. I’ve always been a list-maker- but by thinking about the gaps of time I actually have in my day and how much I can fit into those specific times, I tend to schedule smarter and make myself more accountable for not wasting moments here and there. When I took the time to plan out my whole week, things ALWAYS went better for me! Stop overestimating what I can get done. When I look at the actual time available and I try to schedule within that, I am a lot more fair with myself- so I’m not so hard on myself when the list of 30 things doesn’t get done. And I try to give myself credit for the multitude of things that come up unexpectedly. It’s not just about what I actually get done, but also how I feel about it. This sounds like such a bad thing- but it’s all about finding a place where YOU put unnecessarily high standards on yourself in ways that don’t really affect the students that much. It’s about identifying those little things that only really bother YOU- and learning to let go, and cut yourself a break. Sometimes simple things work just as well. Put other people to work. One of Angela’s big tips is to “batch” big tasks- doing similar tasks all at one time so you can get in a groove and don’t waste a lot of transition time. Whether it’s doing most of my copies on one day instead of trekking back and forth each morning, or grading on one evening instead of a few minutes here or there, batching has made a big difference in me getting things done without feeling like I’m constantly working. These are some of the BIG ideas, so maybe they don’t sound revolutionary- but they are much easier said than done. Angela’s club content goes into so much detail about specific strategies, and offers printable resources (like the To Do list above) to make implementing each change easier. If you’re hearing about the 40 Hour Teacher Workweek Club and feeling too overwhelmed to start one more thing, I completely get it. As a VERY “Type B” teacher who already felt like there weren’t enough hours in the day, I was hesitant to join a course. But I had read Angela’s books and her blog, and I knew she had a lot of helpful tips. More importantly- I thought if there was even a chance of getting more of my life back, it was worth investing in. Once I joined, I started getting weekly articles from Angela. She sends an audio version, too, so sometimes I save time by downloading it and then listening on my commute. Even when I wasn’t able to read or listen that week, it was no big deal- all of the content gets archived on the site to access whenever I do have time to get caught up. Besides the e-book content, one of the best parts of joining is the exclusive Facebook group, full of hundreds of supportive teachers who give suggestions, ideas, and encouragement. You are not alone in being overwhelmed sometimes by this rewarding but difficult job. The group isn’t about being perfect, or about completely changing everything that you do. It’s about small steps that add up to BIG changes- and for me, the 40 Hour Teacher Workweek Club has made a huge difference. I can’t wait to make more changes this year and spend even more time with my family. As important as teaching is to me, I need to learn strategies for better balancing my priorities so I can give my family the time and energy they deserve from me- and so I don’t burn out! If you’re thinking you might need this too, be sure to check out this post from Angela that will give you tips for making the most of your summer- and give you a better idea of what you can expect in the 40 Hour Teacher Workweek Club! P.S.- In full disclosure, I am an affiliate of the program, but I’m sharing this because I’ve been a member myself since October and I really believe in it. My husband commented on how much more he sees me, and I even convinced my mom to join! P.P.S.- If you are interested, be sure to check it out SOON! The club only opens enrollment twice a year, and this will be your last chance to join until December. It's that time again! I am so excited to be hosting this year's Shark Week link-up with Matt from Digital: Divide and Conquer. I'm a fourth grade science teacher who used to work as a reading specialist, so I am always looking for ways to incorporate a little reading into my science lessons. One of our standards asks kids to look at how fossils are used to tell us about the past, and I love to get kids comparing prehistoric creatures with similar ones alive today. Of course, kids LOVE to read about a giant shark called the megalodons- so for Shark Week, I'm sharing this quick freebie with you! 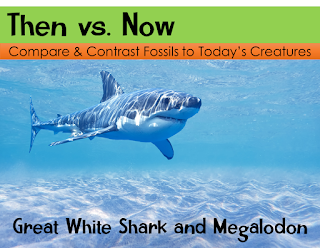 On this "Then vs. Now" passage, your kids will have a chance to compare and contrast great white sharks and megalodons using the color-coding strategy that's been so popular in my Text Detectives- Find the Text Evidence resources. Better yet, this asks them to go beyond just color-coding and use text evidence to write an essay that compares and contrasts these two sharks. I hope your kids really enjoy learning about these amazing animals! Click on the photo above or click HERE to download. 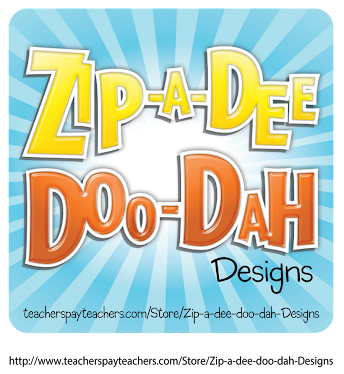 Be sure to go on to Heather's blog at Learning with Mrs. Langley and check out her freebie. You can follow the hop around or look at the Inlinkz below to find some great resources for your classroom- but hurry! These JAWSOME freebies may only be free during Shark Week!